Five-year old Murtaza Ahmadi received a very special package, sent specially by his favourite football player Lionel Messi. 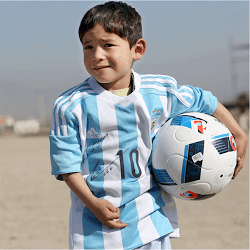 The boy from Afghanistan became a hit online after he was pictured wearing a homemade shirt that bore Messi’s famous number ten, and, thanks to how popular the picture became, he has finally been able to receive the real thing, sent to him directly from the legendary Argentine footballer himself. The child was located with the help of BBC Trending after he became known worldwide as Messi’s biggest fan, and the Jaghori District native, who called the Eastern Ghazni province of Afghanistan home, could not have been more thrilled. The management team behind Lionel Messi confirmed Thursday that little Ahmadi had been sent a shirt signed by the Barcelona forward, and the little tyke was over the moon when he received the gift. The search for the little boy was set off by a single photo that very quickly went viral, which showed Ahmadi wearing a shirt made from a striped blue plastic bag, in honour of the world-famous Argentina strip. Ahmadi was finally identified as the boy in the picture was recognised by his uncle, Azim Ahmadi, an Afghan now residing in Australia, and his uncle made it possible for BBC Trending to make contact with his brother, Arif Ahmadi, the boy’s father. The Ghazni farmer verified that his son was the little boy who had managed to capture so many people’s hearts and imaginations worldwide, and stated that his young son was over the moon about the gift. Lionel Messi, when he is not tearing up the football fields of the best stadiums in the world, also performs in the role of Goodwill Ambassador for the United Nations Children’s Emergency Fund, UNICEF, and it was this agency that helped him get the longed-for shirt to the little boy. Messi added some extra shirts to the package, all of which were gratefully received by the Ahmadi family, and one even got into the hands of the young man responsible for the uproar in the first place: Murtaza’s older brother, Hamayon, was the person who first published the picture on Facebook. Murtaza Ahmadi was able to finally meet his hero when he, at the ripe old age of six-years old, had the honour of walking out onto the football field with the open-hearted five-time Ballon d’Or winner before Tuesday’s match.